Working as a welder can be a very solid career. Individuals in this field often spend a great deal of time mastering the skill. Though it may look easy to do, there are various components to learning this skill that can make or break a person’s career. Individuals who are looking for an opportunity to enter this field should first learn what to expect from it and then obtain the necessary education in this field. The good news is the training is virtually all on-the-job, which means that from the start, individuals will be doing the skills they will use on the job. You may be able to learn whether or not you like this craft very quickly. 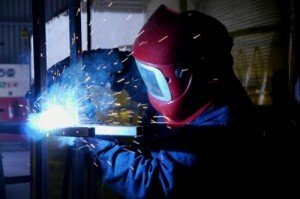 People working in the field as welders often have a physically demanding job. They work as welders, solderers, brazers, and as cutters. They often work to fill holes and make changes to metal components to create strong, solid pieces that can do the job necessary. They may work with various types of metal and they often use hand-held equipment to do the job. This welding equipment often requires steady attention and the ability to maintain a steady hand throughout the process. Welders work in a variety of situations. Some work in building construction. Others work in car shops, metal works locations, and automotive manufacturing plants. These individuals may work in their own businesses, too, providing on-spec work for a variety of different needs. Often, these individuals endure difficult situations physically. They will need to work under extreme circumstances, which requires following specific steps to ensure safety. In some situations, welders work on high scaffolding, such as when working on the metal components of a building. In other cases, they must lift heavy objects and support themselves in strange positions to meet the needs of the job. Sometimes they will work in a factory under demanding circumstances. Some states have requirements for individuals working in this field to have a license to do so. This is not often the case, though. More common, individuals work in this field with on the job training. Nevertheless, some employers may require specific trade school education to get into the job. Most will need to have at least a high school diploma or the equivalent to begin their education and training in the field. To work in this field, individuals need to have very specific skills. Learning these skills can be a challenge. To do so, most students enter into a vocational school. According to ThomasNet.com, there is a strong desire from employers for their employees to have vocational or trade school education in the field before they enter into it. This type of training often includes hands-on learning with the various types of equipment that is commonly used on the job. Additionally, there are apprenticeship programs available in some areas. These are not often requirements, but they can be an ideal way for the student to gain the necessary education to do well in this field. Then, most welders will have on-the-job training to ensure they know the safety requirements and methods for using equipment within the specific field. Individuals who work in this field can expect to find a job in the long term. According to the Bureau of Labor Statistics, the field is likely to see a growth rate of about 15 percent between 2010 and 2020, which is about as fast as most other fields. About 50,700 jobs will be added to this industry during that time. In addition, the agency reports that the 2010 median income for people working in this field was $35,450. This may increase for those people who own their own companies and do freelance work.